My bro and his wife were down for the holiday weekend which meant korean food time. Whether it is mom’s cooking or going out, it’s always good to get a hit of korean food every once in awhile. After a lunch at the H Mart food court and an afternoon of rambling about town, we decided to hit up a new spot for dinner. 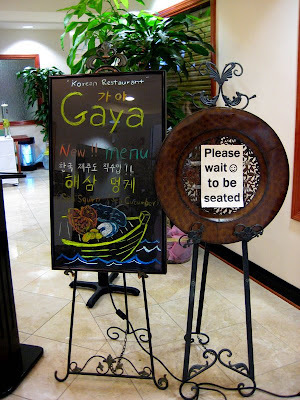 We went to Gaya, which is a korean restaurant / banquet place in the burbs. It’s kinda fancy and all, which means expensive. We saw at least one wedding banquet going on while we were here. There’s actually also a japanese place here. So it’s a korean restaurant, japanese restaurant, banquet spot trifecta. Some of the random banchan and other condiments and stuff we got with our meal. 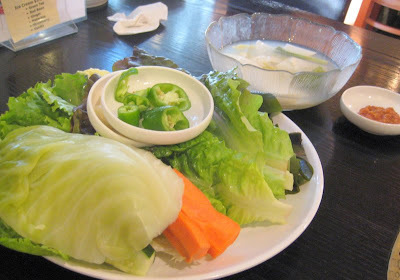 An array of lettuces and blanched cabbage and raw veggies (had never seen the raw carrots and cucumber that was included before in any other korean restaurant before). The bowl with the clearish liquid and radish? I have no idea what the name of this is, but it’s incredibly refreshing in the heat. Zesty too. 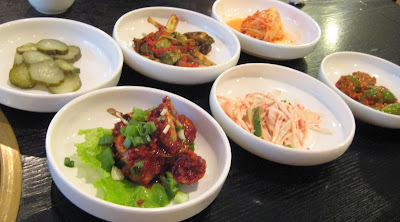 Their banchan was nothing special, except for the dish all the way in the front. It looks like a weird red mess, but it’s actually raw blue crab marinated in a red pepper sauce. 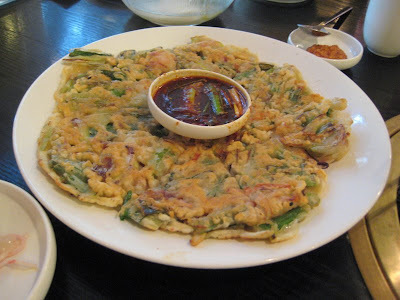 I know the concept is wackadoo, but this is one of my favorite korean dishes, ever. And I totally ate this up. I made my mom ask for a refill. It’s just awesome. Yes, the crab is raw, but this doesn’t phase me at all. It’s just the greatest thing ever. But as my mom said, this has to be beyond fresh. So I’m hoping these buggers were alive on the morning I ate this. We got the seafood pancake, and it was pretty darn good here. Thick, but not too thick, and well cooked. 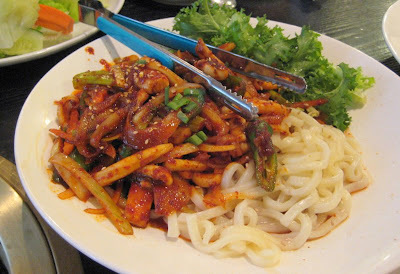 We also got the ojingaboekum, the stir fried squid. And get this, at Gaya, they serve it with a heap of udon noodles. Freakin brilliant I say. Everyone should do this. Their squid was on point. I’m a big fan. We also got a bunch of meat and cooked it at the table. All the tables have their own little cooking pit here. 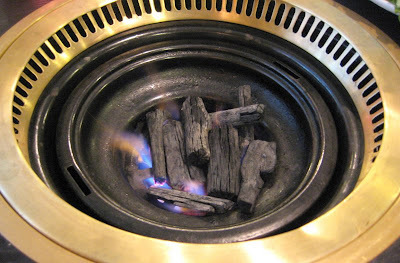 I think it’s a gas grill system but there’s real wood so it gets all charcoaly and stuff. The ventilation must be good because we didn’t come out of there stinking of bbq. Perhaps that’s why it’s so pricey? I totally forgot to take pictures of the actual meat. Duh. We got the house galbi, which ended up being kinda bland. I mean it was excellent quality meat, so it was as if we were eating steak, but there wasn’t enough flavor. So it was like eating korean bbq, but not. Service was good though, and it better well have been because it’s not cheap. i mean korean food in general is not cheap. It’s one of the more expensive asian foods out there. Is it worth the extra $$? Eh, not sure. It was good enough, but maybe not quite worth it. It wasn’t extraordinary or anything. But if I have to go to a wedding banquet, I surely wouldn’t mind. I’ll just make sure that I’ll be able to get some of that crab! Gaya is my favorite restaurant of korean. Usually i have enjoyed dinner with my whole family.